The League of Legends World Championship games are back in full swing. The past two days of the group stage haven’t been super exciting, since most everything ended up going the way people thought it would (i.e., the strongest teams won). The next two days, however, should be positively juicey. Here are the top teams you should keep an eye on during this Saturday and Sunday’s games. KT Rolster is one of the top Korean teams to make it into Worlds this year. While they’re not considered to be as strong as SK Telecom 1—the 2013 World Championship team and a strong contender to win the whole thing this year—KT is still really strong compared to the rest of the competition. They’re currently in second place in their group with a 2-1 record. Origen, the top team in group D, is more of a curiosity than KT simply because they’re so new. The team was only founded in December 2014 when Enrique “xPeke” Cedeño Martínez decided to leave fellow European League team Fnatic. He ended up recruiting Paul “sOAZ” Boyer, another strong pro League vet, as well. So even though the team is technically new and untested in the League eSports scene, they also came out swinging this year with two of the best European League of Legends players ever—Cedeño and sOAZ are the only two pros who’ve managed to qualify for four different World Championships. Origen has started the 2015 Worlds really strong, going 3-0 in their first round on the group stage. Their game against KT Rolster tomorrow should be particularly exciting. Tomorrow’s games start at 6:00 am EDT. For anyone who doesn’t want to struggle out of bed that early in the morning, remember: there’s going to be a rebroadcast later in the day. Fnatic has long been regarded as one of the best League of Legends teams there is. They won the very first World Championships back in 2011, and have been fighting tooth and nail to get back to the number one spot ever since. They got the 2015 Worlds off to a very aggressive start when they forced Invictus Gaming into a surrender—something that rarely happens in pro games, at least at this level. Can’t wait to see that rematch come Sunday. I’m betting Invictus is gonna be feeling more than a little salty! Cloud9, on the other hand, hasn’t been considered a strong team for much of 2015. They went through a number of high-profile roster changes this year, starting when their star player Hai announced his plans to retire into a coaching/analyst type position. He ended up stepping back into the game a few months later in a different position than the one he’d previously played after C9’s jungler dropped off the team. 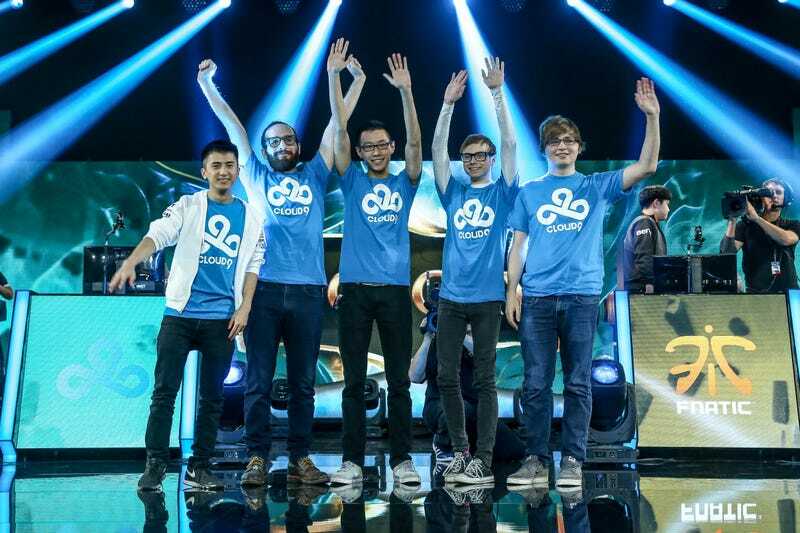 Then C9 ended up making it into Worlds by the skin of their teeth when they pulled off a spectacular series of comeback games when playing in the North American region’s last round of post-finals playoffs. With North American League of Legends Championship Series winners Counter-Logic Gaming officially out of the running after their bad bout of losses yesterday, many League eSports followers have started referring to C9 as the last and greatest hope the U.S. has to make any sort of dent in Worlds this year. I should note that Team SoloMid (TSM) is also still in the running (they play in group D’s games on Saturday), but people don’t have as high expectations for them. Is Cloud9’s amazing Cinderella story continue on Sunday? That’s the question I’m keen on getting an answer to. Their game against Fnatic should be particularly interesting. Read more about what’s happened at Worlds so far in our explainer. The Sunday games start at 4:00 am EDT. Again, there will be a rebroadcast later on Sunday. Thank god for that!